If you’re like me, I am sure you have a diverse array of interests; which no doubt are a big part of your life. That is how interests work. We find them, we cultivate them and they become a part of WHO WE ARE. So, it is understandable that one would have the desire to accessorize their life with the things that they love. One of the most popular interests as we know is billiards and people from all over the world have embraced this game (or sport) of focus and precision as their own since its early inceptions in the 15th century. 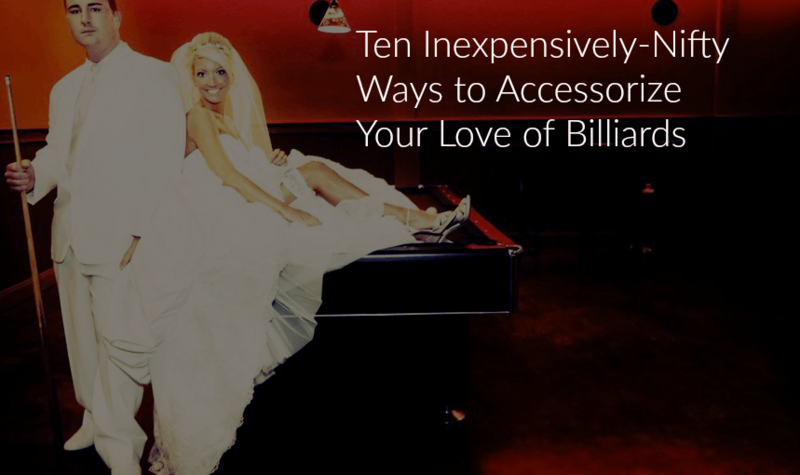 In honor of this hallowed pastime, let’s take a look at some of the interesting and affordable ways a billiards fan can express their love of the game via accessorizing. Everyone has a smartphone these days – even Grandpa! So, given the technologically-obsessed nature of our society these days, it makes perfect sense that there are some really cool smartphone cases out there. If you’ve got an interest I am sure there is a smartphone case for you, regardless of niche. But for the more obscure interests, you may have to do a Google search, because not EVERYTHING is available on Amazon, but almost. Even this! Made by herywan, this very sleek Galaxy S3 III case is durable and lightweight and features a sharp green background with the colorful “break” in progress, prominently featured. 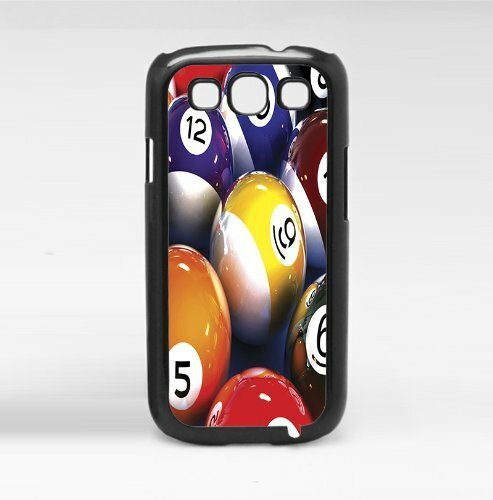 This case is surely a must-have item for any billiards fan and one that won’t break the bank. You can check it out the full product page here. Stuss Case is another maker (among many), of smartphone cases and this cool design is ideal for the most fervent of billiards fans. 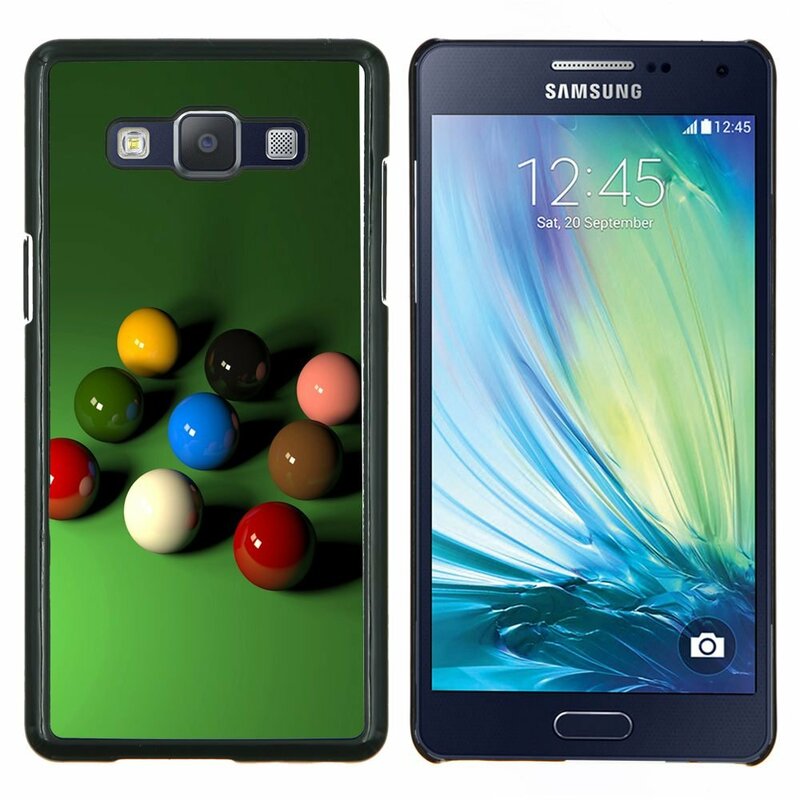 This attractive design is available for many models of Samsung smartphones in addition to a multitude of other designs for not only Samsung phones but for HTC, Sony, LG, Blackberry and Motorola as well. Be the envy of all your pool hustling friends at this weekend’s billiards tournament by picking up this or any other pool-inspired smartphone flare. You can check out the full product page her﻿e. Not only is carrying around a wallet SO old fashioned and CUMBERSOME, studies have shown that using a wallet is detrimental to the alignment of your spine – not to mention uncomfortable and painful to sit on! A money clip is the WAY TO GO. Trust me, I have been using a money clip for years and I have never looked back. This Sterling golden-colored 9-themed money clip is brass plated and made of steel by Sterling, and can hold around ten to twenty bills comfortably. 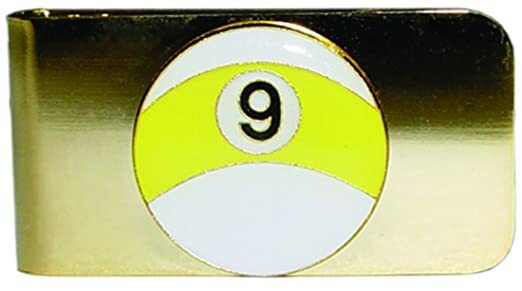 This most stylish clip will be a welcomed-addition to any billiard fan’s wardrobe. Belt buckles are an immediate way to show the world that you enjoy making an impression. From subtle to clever to AWESOME to WILDLY inappropriate, belt buckles are notorious conversation pieces. I used to wear them all the time in my twenties, but have since given them up. 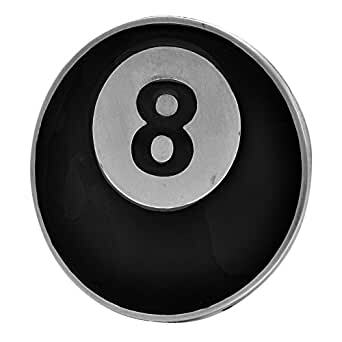 I wish I was into billiards back in those days because I could have picked up this little gem to show everyone that I’m a fan of the Eight-Ball. Very few images are more iconic than the good old Eight-Ball and the instant association it has with the game of pool is palpable. So it would be a no-brainer for the pool enthusiast to head on over to Amazon and pick this bad boy up. Made by Buckle Rage, this lightweight Eight-Ball buckle is crafted in Zinc Alloy with a Black Enamel Fill and fits all standard 1.5” Snap on Belts. You can check out the full product page here. What billiards fan would not want a pool-themed mousepad? This colorful mousepad, which was made by Zenzzle will definitely spruce up your computer work station and make every moment you stare at the glowing screen a little less draining. Plus, who wants a BORING mousepad? ﻿﻿Show your co-workers that you have interests﻿﻿ outside of the workplace and take a stand against office culture mediocrity. Zenzzle’s mousepads are digitally printed and offer a natural non-slip rubber backing with a smooth surface that will make surfing the web a dream. The company also offers a custom made service where you can submit your own image for printing, which you can do by contacting them via Amazon’s Messaging system, although with this billiards mousepad, why would you want anything else? Few things are more ﻿﻿annoying to the well-dressed man﻿﻿ than when your tie is blowing in the wind; making your appearance unkempt and ridiculous. Alas, it happens to the best of us, but it does not have to. 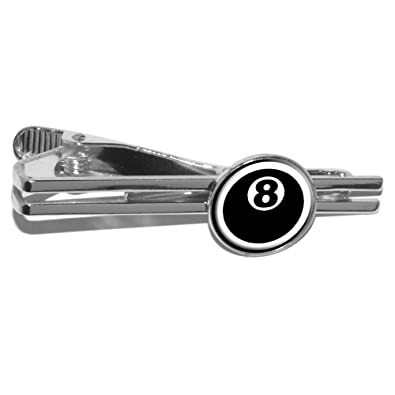 You can do something about it, like head on over to Amazon and pick up this E﻿i﻿ght-﻿Ball tie bar clip, which is not only useful, but LOOKS GREAT. Plus you get to make it abundantly clear that you are a billiards-player, which with any luck could be to your advantage during that important interview or business meeting, for you never know who else shares your love for the green-felted table. Graphics and More makes this 2.25” silver tie clip, which is made of plated metal and the awesome Urethane encased design you see here. ﻿﻿Add a bit of personality to your professional appearance﻿﻿ and snag one of these clips for yourself before they sell out. 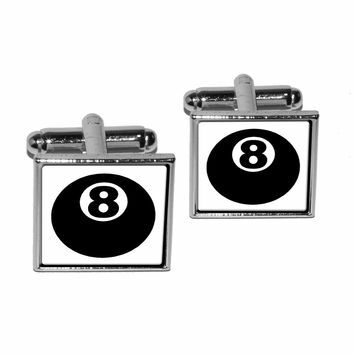 These jazzy Eight-Ball Cufflinks, which are also made by Graphics and More, are the perfect accompaniment to that Eight-Ball tie clip you know you want, so you might as well just pick them both up so you have a complete set. After all, obsession (of all kinds) is all-encompassing, so why not just give in to your s﻿hopping i﻿mpulses? Like Graphics and More ‘s tie clip, this cufflinks set is also made of plated metal with the Urethane encased Eight-Ball design. Don’t settle for average, when you can take your business attire to the next level and truly dress to impress. Dog Tags are obviously a s﻿taple amongst milita﻿ry personnel, but a niche accessory for everyone else. However, there is a population of people out there who absolutely LOVE Dog Tags – especially those that also feature a bottle opener. So, it was a welcomed surprise that a bottle opener Dog Tag exists that serves as a billiards tie-in too. 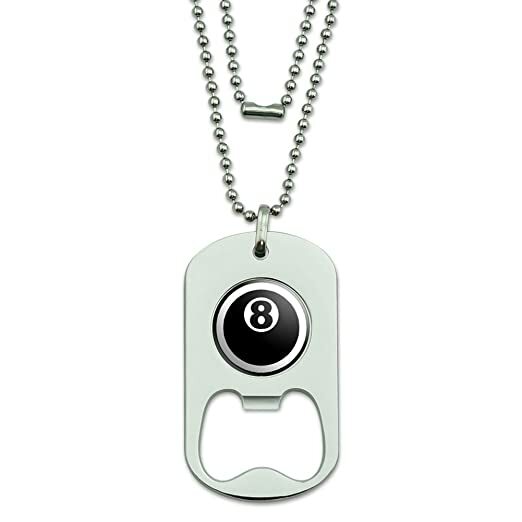 Made from heavy duty chrome plated metal by Graphics and More, this fashionable Dog Tag bottle opener allows you to be both a fashionable AND useful member of your billiards entourage, as you can effortlessly be the go-to beer opener. It’s a thankless job, but someone has to do it; might as well look good while doing it. 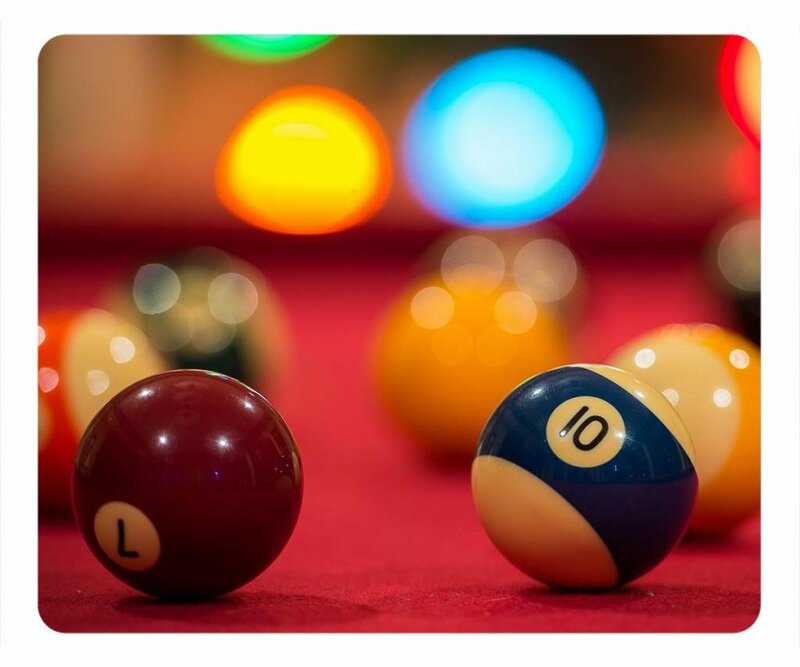 The 24” chain can easily be adjusted to fit billiards enthusiasts of all shapes and sizes, and the Eight-Ball design is Urethane-encased in a UV-resistant resin – ensuring your magnificent Eight-Ball retains its glory for a long time. Effortlessly be the go-to beer opener, someone has to do it! For the watch-aholic who happens to LOVE﻿ ﻿shooting pool as much as they enjoy collecting watches, Oirenefashion is here to fill that need with their Billiards Quartz wristwatch. This simple, yet stylish watch features an analog display and that classic billiards image set against a green background, which is held together by a 0.75” Polyurethane band that is available in beige and yellow. 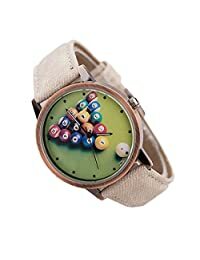 There is no doubt that you will be filled with joy with each glance at your new watch, for you will constantly be reminded that your next pool game is only hours away. 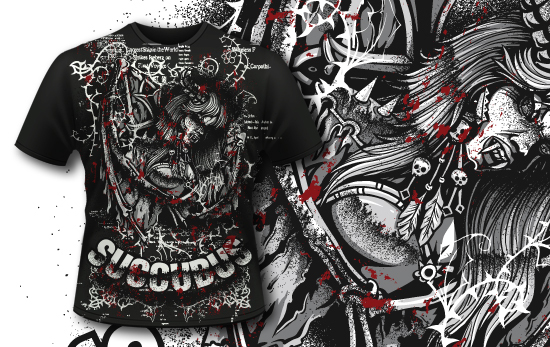 As far as novelty t-shirts go, there are SO many out there in the internet wormhole﻿﻿﻿﻿﻿ that it is an exhausting proposition trying to find one that can fit the exact niche you are looking for, while also NOT featuring a distracting design that has TOO MUCH going on. Personally, I am not a big fan of BUSY t-shirts and have always leaned towards the less is more philosophy when shopping for t-shirts. 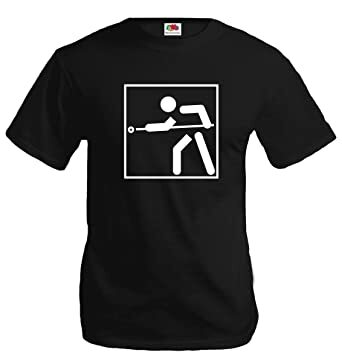 Happily when sifting through Amazon’s novelty t-shirt pages, I found this little beauty, which can accomplish the job of saying I LOVE POOL, while not being visually jarring. This minimalistic but awesome Fruit of the Loom tee is made from 100% cotton and available in black, white, red and green (my personal favorite). Also, the white billiards design is a high quality durable print that is sure to look amazing in the mirror for a long time.